There is nothing better than good, crispy, chicken skin! Notice that the chicken thighs are carefully nestled in the pan so that the whole thigh is covered except for the skin. This is the secret to perfectly braised chicken thighs! Share the moment #youplateit with us on Instagram and Facebook - we love to share your triumph. Pat dry chicken with paper towel. Season chicken on both sides with salt. Heat a large high sided pan over medium-high heat and add chicken, skin-side down. Cook without moving until skin has browned and fat has rendered, about 5 minutes. (Note: The chicken doesn't need to be cooked through at this point). Remove chicken from pan and set aside, skin-side up. While chicken browns, thinly slice the mushrooms. Peel and mince the garlic. Peel and medium dice the potatoes into 1 cm cubes. Place mushrooms and garlic in the pan with a large pat of butter. (Tip: The moisture from the mushrooms and the butter will help to “deglaze” the pan, loosening all the yummy little chicken bits stuck to the bottom.) Cook the mushrooms and butter, seasoning with a little salt, until they start to soften and brown. Once the moisture from the butter and mushrooms has almost evaporated, finish the deglazing process by adding the balsamic vinegar. Stir to combine. Reduce balsamic by half. In the meantime, boil kettle. Mix the stock concentrate with 1 cup hot water. Add the chicken back to the pan along with any juices, skin side up. Add enough chicken stock to cover the chicken thighs by ¾, leaving only the skin exposed. Simmer for at least 15 minutes and up to 25 minutes for more tender chicken. While the chicken is braising, add the diced potatoes to a pot and fill with boiling water. Cook 12-14 minutes, or until tender when pierced with a fork. When ready to mash, drain potatoes and return to the pot. Season with salt and pepper. Add a dash of milk (or water), and butter to taste. Using a potato masher, mash to your desired consistency. Set aside, covering to keep warm. Remove chicken thighs from the pan, set aside on a clean plate. Increase the heat to medium-high. Reduce the liquid by half or until it thickens slightly. Turn off the heat, then stir through a handful of spinach. 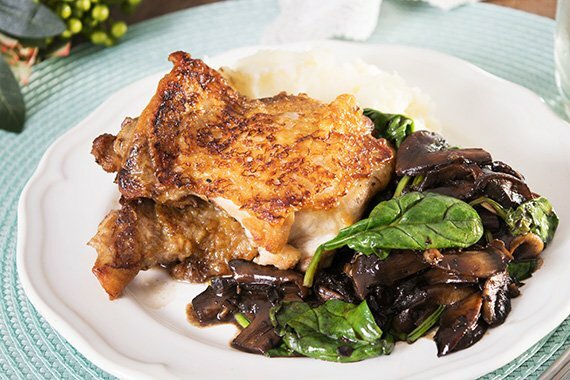 Divide mash, chicken and balsamic mushrooms between plates. Enjoy!